The phenomenon of informal building Spread recently in Iraqi residential areas, in general, and in Baghdad, in particular, due to the urgent housing need, on the one hand, and lack of commitment to building controls, on the other hand, to highlight the phenomenon of uncommitted building to controls and housing governing legislation in Iraq, leading to heterogeneity in both building densities and plot areas, and disorder in the urban fabric and urban escape of those areas. Research problem identified as the absence of a clear vision about the General aspects of the phenomenon of informal building in residential street scene, and the role of designed housing projects as a substitute for informal building in built residential areas. The designed housing projects (single or multi story buildings), which designed and constructed accordance to the approved planning and construction regulations and legislation, as one of the solution to the housing crisis, that achieve the harmonious at each level of the urban fabric and urban escape. Accordingly the research hypothesis stated as "the designed housing projects achieve homogeneous formal unity in residential street scene." This paper deals with the role of designed residential projects to reduce the phenomenon of informal building and heterogeneity in the urban escape of built residential areas, by identifying the phenomenon in residential areas, in general, and in selected area in Baghdad, in particular, first, and present a designed housing projects ( global and local) that achieve homogeneous formal unity at the level of the urban escape, second, the research identified the principles and the elements of the residential street scene and the organization bases that can be a substitute for the informal building and the heterogeneity of the urban escape in built residential areas, third.انتشرت في الفترة الاخيرة ظاهرة البناء العشوائي في المناطق السكنية لمدن العراق، على وجه العموم، ولمدينة بغداد، على وجه الخصوص، نتيجة الحاجة السكنية الملحة، من جهة، وعدم الالتزام بالضوابط البنائية، من جهة اخرى، لتبرز ظاهرة البناء غير الملتزم بالضوابط والتشريعات المنظمة لقطاع الاسكان في العراق، مما ادى الى عدم تجانس في كل من الكثافات البنائية ومساحات القطع السكنية، والخلل في النسيج الحضري والمشهد الحضري لتلك المناطق. حددت مشكلة البحث في عدم وجود تصور واضح عن الجوانب العامة لظاهرة البناء العشوائي في مشهد الشارع السكني، ودور المجمعات السكنية المصممة بوصفها بديلا عن البناء العشوائي في المناطق السكنية المشيدة. ان المجمعات السكنية المصممة بأنواعها (العمودية والافقية) التي تصمم وتشيد على وفق الضوابط والتشريعات التخطيطية والبنائية المعتمدة كأحد الحلول لازمة السكن بما يحقق التجانس على مستوى كل من النسيج والمشهد الحضري للمناطق السكنية، وعليه حددت فرضية البحث بـ " ان المجمعات السكنية المصممة تحقق الوحدة الشكلية المتجانسة في مشهد الشارع السكني ". يتناول هذا البحث دور المجمعات السكنية المصممة في الحد من ظاهرة البناء العشوائي وعدم التجانس في المشهد الحضري للمناطق السكنية المشيدة، من خلال التعرف على ظاهرة البناء العشوائي في المناطق السكنية، بصورة عامة، وفي بغداد ، بصورة خاصة، اولا، وعرض مجموعة من النماذج لمجمعات سكنية ( عالمية ومحلية) التي تحقق وحدة شكلية متجانسة على مستوى المشهد الحضري، ثانيا، وتوصل البحث إلى تحديد مقومات وعناصر مشهد الشارع السكني واسسه التنظيمية التي يمكن اعتمادها بديلا عن البناء العشوائي وعدم تجانس مشهد الحضري في المناطق السكنية المشيدة، ثالثا. Informal building --- informal housing --- urban escape --- residential street scene --- designed housing projects. --- البناء والسكن العشوائي،المشهد الحضري، مشهد الشارع السكني، المشاريع السكنية المصممة. An investigation was conducted for the study of extraction of metal ions using aqueous biphasic systems. The extraction of iron, zinc and copper from aqueous sulphate media at different kinds of extractants SCN−, Cl- and I-, different values of pH of the feed solution, phase ratio, concentration of metals, concentration of extractant, concentration of polymer, and concentration of salt was investigated. Atomic absorption spectrophotometer was used to measure the concentration of iron, zinc and copper in the aqueous phase throughout the experiments. The results of the extraction experiments showed the use of SCN− as extractant, pH=2.5, phase ratio=1.5, concentration of metals 1g/l, concentration of extractant 0.06 %, concentration of polymer =50 %, and concentration of salt=20% gave the highest value of percent removed. Also increase of extractant concentration increases the percent removed. The results clarified that increasing the metal ions concentration in the aqueous phase causes to decease the percent removed. The addition of an inorganic salt (sodium sulphate) up to (20%) increased the dehydration of polymer chains and then increases the percent removed.تم في هذا البحث دراسة عملية استخلاص ايونات المعادن من محاليها المائية باستخام انظمة الطورين المائية. تتضمن الدراسة استخلاص ايونات الحديد,الزنك والنحاس من وسط محلول كبريتي تحت ظروف مختلفة وهي: نوع المذيب SCN-,Cl-,I- ,pH المحلول ,نسبة الطور,تركيز المعادن تركيز المذيب المستخدم , تركيز البوليمر ,وتركيز الملح .تم تحليل النتائج باستخدام جهاز الامتصاص الذري ,واظهرت التجارب ان استخدام ((SCN- كمذيب وpH (2.5) ونسبة الطور (1.5) وتركيز المعادن (1 غم /لتر) وتركيز المذيب (0.06 % حجما) وتركيز البوليمر (50 % وزنا) وتركيز الملح (20 %) تعطي اعلى قيمة لنسبة الازالة للمعادن, كذلك بزيادة تركيز المذيب يزداد معامل الاستخلاص وان زيادة تركيز ايونات المعادن في المحلول المائي تسبب نقصان في معامل الاستخلاص .ان اضافة الملح غير العضوي ( كبريتات الصوديوم) لغاية 20 % تسبب زيادة لنسبة الازالة. Project management are still depending on manual exchange of information based on paper documents. Where design drawings drafting by computer-aided design (CAD), but the data needed by project management software can not be extracted directly from CAD, and must be manually entered by the user. The process of calculation and collection of information from drawings and enter in the project management software needs effort and time with the possibility of errors in the transfer and enter of information. This research presents an integrated computer system for building projects where the extraction and import quantities, through the interpretation of AutoCAD drawing with MS Access database of unit costs and productivities for the pricing and duration of tasks, then exported to MS Project and MS Excel. The system was developed by using Visual Basic and ActiveX automation technology for combining the above software. The system, also, can calculate quantities of materials. The system includes digitizer (on-screen takeoff) calculates the lengths and areas of the drawings to which the form of an image and scanned. The integrated system has been applied to case study, a storages building for hospital 260 beds. The results proved the effectiveness of the system for the conversion of information from the graphical form dwg to numerical formulas xlcx / xlc and mpp can be handled easily pleased and software are covered.ا تزال إدارة المشاريع تعتمد التبادل اليدوي للمعلومات و بالاستناد على الوثائق الورقية. حيث يتم رسم الخرائط و المخططات التصميمية بمساعدة الحاسوب ,CAD لكن البيانات المطلوب ادخالها لبرامجيات إدارة المشاريع لا يمكن استخراجها مباشرة من CAD بل يجب ادخالها يدويا من قبل المستخدم. ان عملية أخذ و تجميع المعلومات من المخططات التصميمة و ادخالها في برامجيات ادارة المشاريع تحتاج الى جهد و وقت مع احتمال حدوث اخطاء في نقل و ادخال المعلومات. هذا البحث يقدم نظاما حاسوبيا متكاملا لمشاريع المباني حيث يقوم باستخلاص و استيراد الكميات عن طريق ترجمة مخططات AutoCAD مع قاعدة بيانات MS Access بالكلف و الانتاجيات لحساب الاسعار و المدد الزمنية للفعاليات ثم تصديرها الى برامج MS Project و MS Excel. تم تطوير النظام بأستخدام Visual Basic و تقنية أتمتة ActiveX لربط البرامج اعلاه. بالاضافة الى حساب كميات المواد , يتضمن النظام Digitizerلحساب الاطوال و المساحات للمخططات التي تكون بصيغة صورية. تم تطبيق النظام المتكامل على دراسة حالة لبناية مخازن لمستشفى 260 سرير. اثبتت النتائج فعالية النظام في تحويل المعلومات من صيغتها الرسومية dwg الى صيغ عددية xlcx / xlc , mpp يمكن التعامل معها بسهولة و يسر بالبرامجيات المشمولة بها. The objective of this research work is to evaluate the quality of central concrete plant of Al-Rasheed Company by using Six Sigma approach which is a measure of quality that strives for near elimination of defects using the statistical methods to improve outputs that are critical to customers. The fundamental objective of Six Sigma methodology is the implementation of a measurement-based strategy that focuses on process improvement and variation reduction to reach delighting customers, and then suggesting an improvement system to improve the production of concrete in Al-Rasheed State Contracting Construction Company. A field survey includes two parts (open and close questionnaire) that aimed to get the data and information required for achieving the research where the answers of questionnaire sample have led, during the application of DMAIC improvement cycle, to identifying the potential possible reasons that caused quality deviations in concrete works. Two programs have been used: First, ‘Sigma Level Calculator’ which is formulated by the researcher to measure the components of the processes performance. Second, ‘QI Macros Lean Six Sigma SPC Software 2011’ which uses the statistical tools of Six Sigma DMAIC methodology for: identifying the root causes of defects, analyzing the data, determining capability and stability of process. It is concluded that the processes sigma level for the concrete works quality is 2.41 σ and 181,070 DPMO which is considered too bad as compared with the current global competition.ان غاية هذا البحث هو تقييم جودة أنتاج الخلاطة المركزية للخرسانة التابعة لشركة الرشيد بواسطة استخدام منهجية ستة سيغما والتي تمثل مقياس للجودة تكافح لتقيل وأزالة العيوب بواسطة توظيف الطرق الاحصائية لتحسين المخرجات التي يهتم بها الزبون (المخرجات الحاسمة للزبون) علما ان الهدف الاساسي من منهجية ستة سيغما هو تطبيق استيراتيجية اساسها القياس تهدف الى التحسين المستمر للعمليات وتقليل الانحرافات وبالتالي تحسين الجودة للوصول الى الرضاء الكلي للزبون من خلال تقديم ما يفوق توقعاته، ثم اقتراح نظام لتحسين جودة الأنتاج الخرساني في شركة الرشيد العامة للمقاولات الأنشائية. تضمن المسح الميداني كلا" من الأستبيان المغلق والمفتوح والذي يهدف للوصول الى البيانات والمعلومات الضرورية التي تساهم في انجاز البحث حيث أدت اجوبة عينة الأستبيان، خلال تطبيق مراحل دورة التحسين (دمايك)، الى تمييز ابرز الاسباب المحتملة لتردي جودة الأعمال الخرسانية . كما تم استعمال برنامجين حاسوبين: الاول Sigma Level Calculation والمعد من قبل الباحث لقياس مكونات فعالية أداء العمليات الانتاجية. الثاني QI Macros Lean Six Sigma SPC Software 2011 والذي يستخدم الادوات الاحصائية لدورة دمايك في منهجية ستة سيغما للأغراض التالية: تمييز الأسباب الجذرية للعيوب فضلا عن تحليل البيانات بالاضافة الى تحديد مقدرة وثبات العملية الانتاجية. حيث تبين ان مستوى سيغما لعمليات جودة الإنتاج للاعمال الخرسانية كان 2.41 سيغما و181070 عيب لكل مليون فرصة والذي يعد قليل مقارنة" بمقاييس المنافسة العالمية الحالية. Variable-Length Subnet Masks (VLSM), often referred to as "subnetting a subnet", is used to maximize addressing efficiency. The network administrator is able to use a long mask on networks with few hosts, and a short mask on subnets with many hosts. This addressing scheme allows growth and does not involve wasting addresses. VLSM gives a way of subnetting a network with minimal loses of IP addresses for a specific range. Unfortunately, the network administrator has to perform several mathematical steps (or use charts) to get the required results from VLSM. In this paper, a simple graph simulator is proposed (using Visual Basic 6.0 Language) to perform all the required mathematical steps and to display the obtained required information (the subnet ID, broadcast ID, usable addresses for sub networks and others). The simulator also includes the ability to draw a suggested network topology that matches the entries. The implementation of the simulation required only very few entries (IP, prefix and number of subnets).This simulator is useful for students, instructors, and network engineers to analysis and design a VLSM network by providing all required information in simple, fast and easy steps. Moreover, the software draws a full detailed suggested network topology which is considered a helpful tool for the network administrator that he should have.الشبكات الفرعية ذات القناع المتغير (variable length subnet mask) عادة نشير بها الى تجزئة الشبكات الفرعية, وهي تستخدم لزيادة كفاءة العنونة. بحيث يتمكن مدير الشبكة من استعمال قناع طويل من الشبكات ذات الاجهزة القليلة وقناع قصير مع الشبكات ذات الاجهزة العديدة. طريقة العنونة هذه تسمح بالنمو للعناوين ولا تتضمن خسارة في العناوين. الشبكة الفرعية ذات القناع المتغير تعطي طريقة لتجزئة الشبكات بأقل خسائر للعناوين لمدى معين من العناوين. لسوء الحظ ، مدير الشبكة يتوجب عليه القيام بعدة عمليات رياضية (أو استعمال مخططات معينة) للحصول على النتائج المطلوبة من الشبكات الفرعية ذات القناع المتغير.في هذه الورقة البحثية، نقترح محاكي بسيط مع قابلية رسم للشبكة (باستعمال لغة برمجة Visual Basic 6.0 ) للقيام بكل العمليات الرياضية المطلوبة وعرض النتائج المستخلصة (عنوان الشبكات الفرعية وعنوان البث لكل شبكة فرعية و بداية ونهاية عناوين الأجهزة المستخدمة في كل شبكة فرعية وغيرها). المحاكي ايضاً يتمتع بالقدرة على رسم مخطط لشبكة مقترحة والتي توافق المدخلات. تصميم المحاكي يتطلب عدد قليل من المدخلات مثل ( رقم الشبكة و ملحق الشبكة وعدد الشبكات الفرعية). يعتبر هذا البرنامج مهم للطلبة, للمدرسين ولمهندسي شبكات الحاسبات لتحليل ,وتصميم الشبكة الفرعية ذات القناع المتغير عن طريق توفير كل المعلومات المطلوبة بخطوات بسيطة وسريعة وسهلة. أضافة لذلك ، البرنامج يرسم طوبوغرافية الشبكة بكافة التفاصيل والتي تعد أداة مفيدة لمدير الشبكة يتوجب عليه أمتلاكها. VLSM --- IP Addressing --- Subnetting --- Maximize Addressing Efficiency. The presence of heavy metals in the environment is major concern due to their toxicity. In the present study a strong acid cation exchange resin, Amberlite IR 120 was used for the removal of lead, zinc and copper from simulated wastewater. The optimum conditions were determined in a batch system of concentration 100 mg/L, pH range between 1 and 8, contact time between 5 and 120 minutes, and amount of adsorbent was from 0.05 to 0.45 g/100 ml. A constant stirring speed, 180 rpm, was chosen during all of the experiments. The optimum conditions were found to be pH of 4 for copper and lead and pH 6 for zinc, contact time of 60 min and 0.35 g of adsorbent. Three different temperatures (25, 40 and 60°C) were selected to investigate the effect of adsorption temperature on heavy metals adsorption onto Amberlite IR. The equilibrium data were analyzed by the Langmuir and Freundlich isotherms. The thermodynamic parameters such as Gibbs free energy, enthalpy and entropy changes were calculated. Moreover, in order to understand the heavy metal extraction kinetics in the presence of Amberlite IR 120, the ion exchange kinetics was also studied. The ion exchange kinetics data were regressed by the pseudo first-order, second-order models. The results obtained show that the Amberlite IR 120 strong acid cation exchange resin performed well for the removal of lead, zinc and copper.ان وجود المعادن الثقيلة في البيئة تشكل خطر كبير بسبب سميتها. في هذه الدراسة تم استخدام راتنج الامبيرلايت (Amberlite IR120) لازالة الرصاص و الزنك و النحاس من فضلات المياه الصناعية. ان افضل الظروف تم تحديدها بطريقة الدفعة (الكمية المعدة) بتركيز 100 ملغ/ لتر و الدالة الحامضية بين 1 الى 8 و الزمن بين 5 الى 120 دقيقة و كمية الراتنج 0.05 الى 0.45 غم لكل 100 مل من المحلول. تم اختيار سرعة خلط 180 دورة في الدقيقة لكل التجارب. لقد وجد ان الظروف المثلى هي الدالة الحامضية 4 لعنصري النحاس و الرصاص و 6 لعنصر الزنك و الزمن 60 دقيقة و كمية الراتنج 0.35 غم. تم اختيار ثلاث درجات حرارة 25 و 40 و 60 oم للتحري عن تأثير درجة الحرارة على عملية امتزاز المعادن على راتنج الامبيرلايت. و قد تم تحليل البيانات المختبرية بواسطة معادلات Langmuirو Freundlich.تم حساب معالم الديناميكا الحرارية مثل التغيير في طاقة جبس و طاقة الانثالبي و طاقة الانتروبي. لقد تم دراسة حركيات (kinetics) عملية التبادل الايوني وان البيانات المستحصلة تم اختبارها بواسطة معادلات تفاعل الدرجة الاولى والثانية الكاذبة. ان راتنج الامبيرلايت (Amberlite IR120) اثبت اداءه الجيد في ازالة معادن الرصاص والزنك والنحاس. Heavy metals; Simulated wastewater; Sorption; Isotherm; Kinetics; Thermodynamics --- معادن ثقيلة --- فضلات مياه --- امتزاز --- ثبوت درجة الحرارة --- حركيات --- الديناميكا الحرارية. 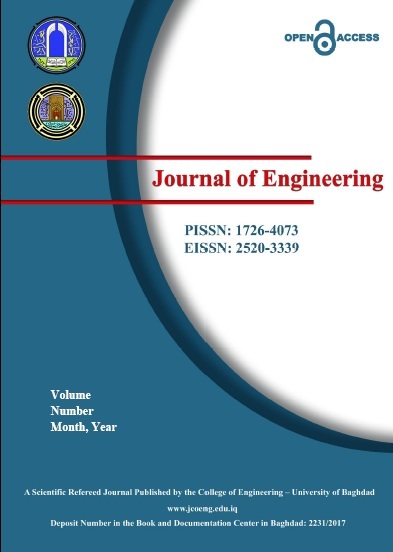 The present study explores numerically the energy storage and energy regeneration during Melting and Solidification processes in Phase Change Materials (PCM) used in Latent Heat Thermal Energy Storage (LHTES) systems. Transient two-dimensional (2-D) conduction heat transfer equations with phase change have been solved utilizing the Explicit Finite Difference Method (FDM) and Grid Generation technique. A Fortran computer program was built to solve the problem. The study included four different Paraffin's. The effects of container geometrical shape, which included cylindrical and square sections of the same volume and heat transfer area, the container volume or mass of PCM, variation of mass flow rate of heat transfer fluid (HTF), and temperatures difference between PCM and HTF were all investigated. Results showed that the PCMs in a cylindrical container melt and solidify quicker than the square container. The increase in mass flow rate and/or temperature difference decreases the time required for complete phase change. Paraffin's solidify quicker than they melt and store more energy than they release.تتحرى الدراسة الحالية عددياً الطاقة المخزونة والطاقة المتحررة أثناء عمليتي الذوبان والانجماد في مادة متغيرة الطور تستخدم في منظومات خزن الحرارة الكامنة. حلت معادلة انتقال الحرارة الانتقالية باتجاهين باستخدام طريقة الفروق المحددة الصريحة وبتقنية التوليد الشبكي. تم بناء برنامج حاسوبي بلغة فورتران لحل المسألة. تتضمن الدراسة أربعة برافينات متغيرة الطور, تأثير الشكل الهندسي لوحدة الخزن الذي تضمن المقطعين الدائري والمربع للحجم نفسه و مساحة انتقال الحرارة نفسها, حجم الخزان أو كتلة المادة المتغيرة الطور, تغيير نسبة التدفق لسائل نقل الحرارة, وفرق درجات الحرارة بين المادة متغيرة الطور وسائل نقل الحرارة. بينت النتائج إن المادة متغيرة الطور في وحدات الخزن الحراري الاسطوانية تذوب وتتجمد أسرع مما في وحدات الخزن الحراري المربعة. زيادة نسبة التدفق و فرق درجات الحرارة يقلل الزمن اللازم لتغير الطور التام. البرافينات تتجمد أسرع مما تذوب وتخزن طاقة أكثر مما تحرر. Most Internet-tomography problems such as shared congestion detection depend on network measurements. Usually, such measurements are carried out in multiple locations inside the network and relied on local clocks. These clocks usually skewed with time making these measurements unsynchronized and thereby degrading the performance of most techniques. Recently, shared congestion detection has become an important issue in many computer networked applications such as multimedia streaming and peer-to-peer file sharing. One of the most powerful techniques that employed in literature is based on Discrete Wavelet Transform (DWT) with cross-correlation operation to determine the state of the congestion. Wavelet transform is used as a de-noising tool to reduce the effects of both clock skew and queuing delay fluctuations on the decision of congestion type. Since, classical Discrete Wavelet Transform (DWT) is not shift-invariant transform which is a very useful property particularly in signal de-noising problems. Therefore, another transform called Stationary Wavelet Transform (SWT) that possesses shift-invariant property is suggested and used instead of DWT. The modified technique exhibits a better performance in terms of the time required to correctly detect the state of congestion especially with the existence of clock skew problem. The suggested technique is tested using simulations under different environments.معظم الدراسات التي تهتم بحل مشاكل شبكة الأنترنت ككشف الأختناق المشترك تعتمد على اجراء قياسات معينة لعوامل الشبكة. هذه القياسات عادة ما تنجز في أماكن مختلفة داخل الشبكة معتمدة في ذلك على مؤقتات داخلية. هذه المؤقتات عادة ماتتعرض الى أنحراف بمرور الوقت مما يؤدي الى عدم تزامن هذه القياسات وبالتالي هبوط في أداء كثير من هذه التقنيات. ان عملية اكتشاف الأختناق المشترك قد أصبحت مؤخرا من الأمور المهمة في كثير من تطبيقات شبكات الحاسوب. على سبيل المثال لا الحصر, تبادل الملفات المتعددة الوسائط (الصوت والصورة) وكذلك المشاركة البينية في تبادل الملفات. واحدة من أفضل هذه التقنيات المستخدمة تعتمد في عملها على المحول ذو المويجة المتقطعة (DWT) مع معاملات التشابه المتناظرة لتحديد نوع الأختناق. يستخدم المحول كأداة للتخلص من تأثيرات كلا من انحراف المؤقت المستخدم في قياس عوامل التأخير وكذلك تذبذب عوامل التأخير الناتج بسبب وجود وحدات الخزن على عملية تحديد نوع الأختناق. ولكن بسبب كون هذا المحول لا تتمتع مخرجاته بخاصية عدم التأثر بالتزحيف والتي تعتبر من الخواص المفيدة وخصوصا في تطبيقات ازالة الضوضاء من الأشارات المختلفة. لذلك تم أقتراح أستخدام محول أخر يدعى المحول ذو المويجة المستقرة (SWT) والذي يمتاز بخاصية عدم التأثر بتزحيف البيانات ليحل محل المحول السابق. أظهرت التقنية المعدلة أداءا أفضل من حيث الوقت المستغرق في عملية الأكتشاف وكذلك الدقة وخصوصا مع وجود خطأ في المؤقت. تم تجريب التقنية المقترحة وبنجاح في ظروف مختلفة. shared congestion --- clock skew --- shift invariant --- cross correlation --- soft-threshold operation.